At the “Alt+Shift Summer Institute: Rethink Possibilities” conference this summer, I had the pleasure of hearing 16 TED-style talks over two days, from people who are asking themselves what they can do to make education accessible to all learners. General and special education teachers, therapists, consultants, parents of students with disabilities, and agency directors talked on what seemed to be a diverse array of topics (literacy, math, instruction, alternative communication, assistive technology, systems), but as the two days unfolded, what became increasingly obvious was that these speakers were actually all talking about the same thing: our students are not that different than we are. Our students want to have an impact on their world, they have hopes and dreams, their lives are enriched through education, and they are served best by adults who take the time to listen to them and get to know them. Although not directly stated, and not intentionally designed, this was the underlying theme of all of the presentations. Speaker after speaker came to the stage and shared their stories about how they came to understand what more they could be doing for students because they themselves could empathize with their students, or found they or someone they cared about had something in common with their students. The speakers then went on to talk about how that positively impacted not just their students, but themselves as people and as professionals. I came away thinking about the correlation between educators who are innovators helping students to be more engaged academically and socially, and their tendency to be people who are curious about other their students, who find what they have in common, and who listen and get to know them. PBS Misunderstood Minds shows how and why students struggle with mathematics, what impact that has, and what we can do about it through simulations, research, and additional resources. The importance of providing each of these students with educators who are invested in who they are and who they can become cannot be overstated. 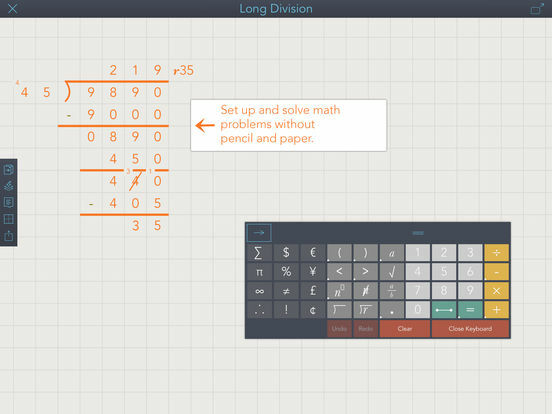 ModMath is a free app for iPad, designed specifically for people with dysgraphia and dyslexia, that allows students to do basic math problem solving, use virtual graph paper to set up math problems legibly, and print/email work. This app was designed by a parent whose child is dyslexic, and is a great example of what kind of support can be provided when adults are listening to students. 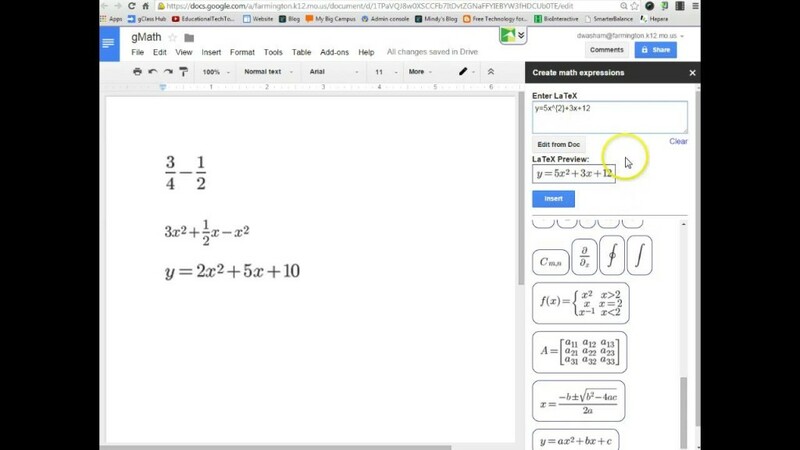 g(Math) is a free Google Add-on for Google Docs and Sheets that allow users to include mathematical equations, figures, graphs and statistical displays within a document or spreadsheet. 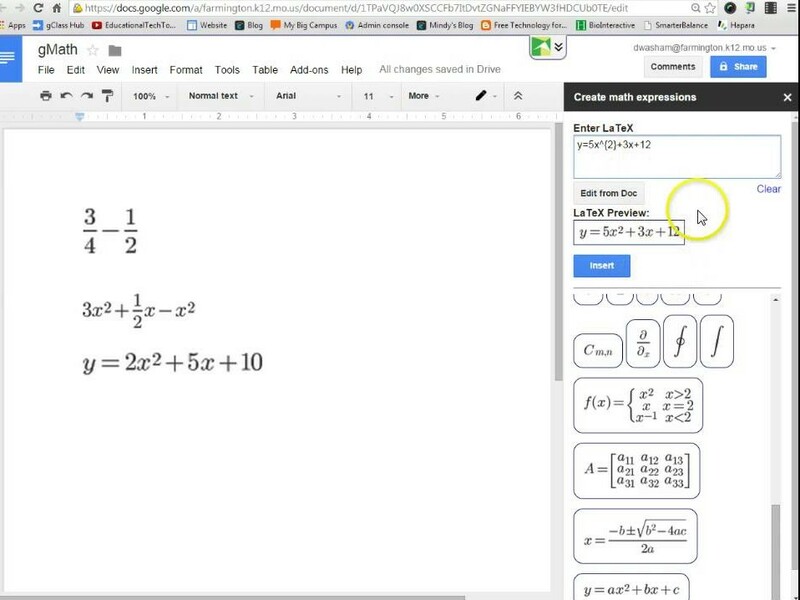 With many schools using Google Classroom, and Google apps, this is another way that students who have difficulty writing or keeping notation organized on a page may be able to demonstrate mathematics knowledge, and work through problems. Access to tools such as this through any computer with a connection to the web increases flexibility and opportunity to learn. Tagged dysgraphia, dyslexia, gMath), graphing software, Kate Fanelli, ModMath. Bookmark the permalink.